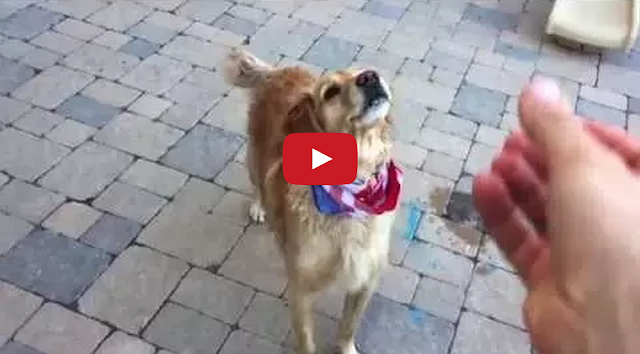 Fritz the golden retriever loves tasty human foods, but unfortunately, he's terrible at catching them. Fritz's human compiled a compilation of his hilarious attempts at trying to catch a steak, a donut, a chimichanga, a meatball, a taco, a hotdog, a strawberry, and more. "Fritz shows no other signs of bad eyesight. He’s much better with a tennis ball. I think he might get overly excited with the food and he commits too soon. And don’t worry, Fritz does not end up consuming everything that is thrown to him. The food is intercepted and he gets a small bite. Keep in mind this is not one day’s work; this is maybe once/twice a week. He’s a healthy boy.﻿"
A chimichanga is one thing. A strawberry?! A FRIGGIN STRAWBERRY!!! This is hilarious. The sound effects really pulled this together. This is really funny but I hope he isn't normally feeding his dog those things. OMG, read the explanation under the video BEFORE commenting! This sadly looks like a replay of my 4 year no hitting streak in softball as a kid. This is so not funny. I have two Goldens -- you take your time to teach them how to catch healthy food until they are as great as Airbud, the basketball catching Golden. Just awful to throw fatty disgusting food in such a way to filthy this gorgeous friend. "And don’t worry, Fritz does not end up consuming everything that is thrown to him. The food is intercepted and he gets a small bite. Keep in mind this is not one day’s work; this is maybe once/twice a week. He’s a healthy boy." See what happens when you read the description rather than passing judgment? My mastiff Goober, can't catch anything at all.